Micah Thatcher hits a ball back during his #1 varsity doubles match against Davis County this past Thursday. Ty Luedtke serves during his #3 varsity doubles match against Davis County this past Thursday. 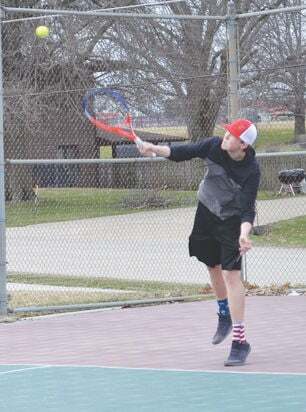 The Chariton boys tennis team delivered another strong performance in a 6-3 win over Davis County at Chariton April 4. 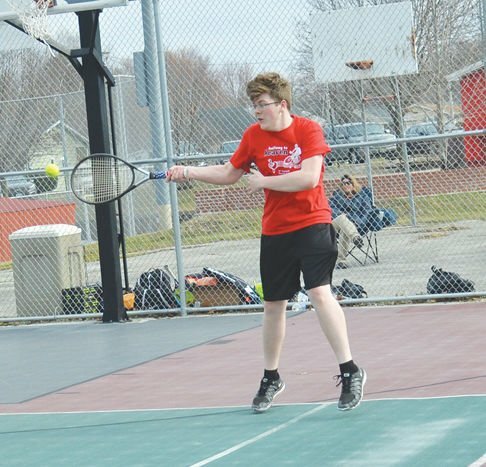 The Charger boys won four singles matches and two doubles matches to get the win and move to 2-0 on the season. In the #1 varsity singles match, Stan Kutsel beat Luke Snyder, 8-4. At #2 Billy Rouw beat Noah Zmolek, 8-2. At #2, Micah Thatcher beat Clayton McFarland, 8-5. At #4, Aaron Sullenger beat Kade Tharp, 8-3. At #5 Logan Caudill lost to Ivan, Garcia, 8-6. At #6, Ty Luedtke lost a very good match to Trevor Slayton, 9-8. In varsity doubles play, the #1 team of Thatcher/Sullenger lost to the team of Snyder/McFarland, 8-6. The #2 team of Kutsel/Rouw beat the team of Zmolek/Tharp, 8-4. The #3 team of Caudill/Luedtke beat the team of Garcia/Slayton, 8-5.